Good morning! I hope you're having a fabulous weekend. Are you going to see fireworks? I think we're going to take the kids to see some tonight. It will be the first time we've taken them to see 4th of July fireworks. In the past, they've gone to bed too early and have been scared. I think they'll enjoy them this year ~ especially since we'll be driving to see them and they can sit in the car if they think they're loud. I didn't get around to getting any 4th of July books for the kids to read this week, but we did get some others. One of the books we borrowed from the library on our last visit is Field Trip Day by Lynn Plourde. In this new picture book, a group of 23 kids goes on a field trip to a farm with their teacher and some chaperones. They get to see the cows being milked, sheep being sheared and the big turbines that power the environmentally friendly farm. But each time they explore a new area of the farm, the chaperones do head count and come up short by one. One of the students named Juan keeps wandering off and discovering more details about the farm. It's a cute, although quite long, story. And if you like books that incorporate math, this is a good one. Each time they do a head count, they count in a different way ~ two sets of 11, two sets of 10 plus 2 kids, 7 sets of 3 plus 2 kids, etc. 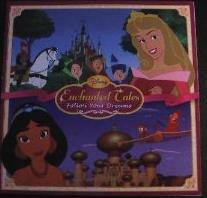 M got a new princess book this week as a reward for good behavior, so she picked out Disney Princess Enchanted Tales: Follow Your Dreams because it has Sleeping Beauty in it. This has two stories. The first is about Princess Aurora being in charge of the kingdom when her parents and her husband go away to a conference. She ends up using Merryweather's wand to help her subjects but things go a bit wrong with the magic. In the end, she solves the problems though. In the story about Jasmine, she asks to have more serious responsibilities than attending ribbon cuttings and helping to sell camels. She ends up having a rough experience as a teacher, but then she shows she has strength and everyone starts respecting her. I have a bit of an issue with these princesses having no serious responsibilities until everyone else is gone, or until they ask to do something more. I guess the feminist side of me has an issue with the princesses in general. But if you have a little girl who loves Disney Princesses, they'll likely enjoy these stories as much as M does. The final "book" I'll mention is a Star Wars Fandex that we got C for finishing kindergarten with good marks. This is a set of cards that fan out so you can see each. In this set, each page has a big cutout picture of a character or ship or planet at the top, and then the rest of the page is filled with details about them. There is text on both sides, which provides for plenty of information. I will say that the reading level is pretty high, so C can't read a lot of these. But he still enjoys looking at them and having us read some of the descriptions. If you have a kid who likes Star Wars, it's a good choice. What have you been reading with your kids lately? 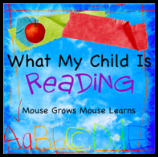 Hop over to Mouse Grows, Mouse Learns to share! Thanks for joining WMCIR and I hope you are enjoying fireworks! It always amuses me to see how much M loves Princess books. Anna occasionally picks one or two in the library, but she has no idea who those girls are except Cinderella - it's too funny. She absolutely refuses to watch any Princess movies saying that Cinderella was too scary. Congratulations on C's good marks in kindergarten! Did your kids like the fireworks? When mine were young (especially my oldest), he didn't like the noise of them. It's nice now to watch them without having to hold our hands over his ears!! visiting via WMCIR - and I love your challenges, your book blog list - wow! just became a follower!